So happy to have Sara here from The Aqua House here again today. 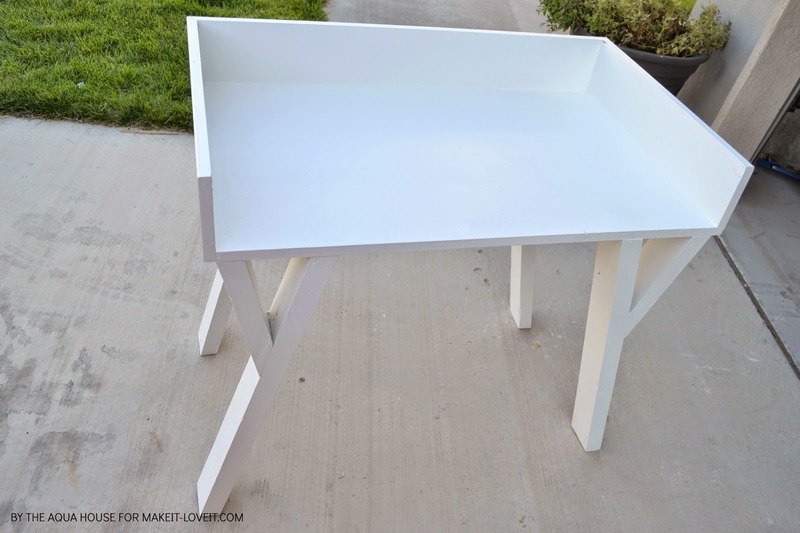 She and her husband created the most darling little Farmhouse Desk……with a simple and sleek design. 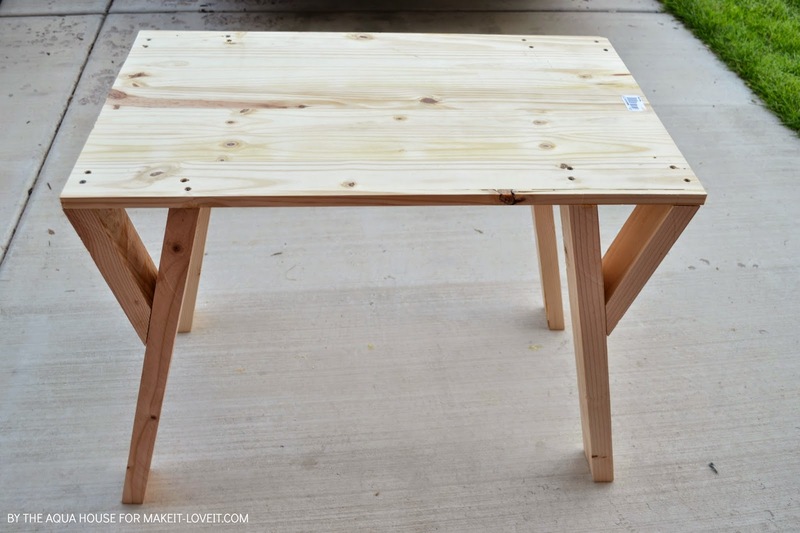 The open front cubby design functions well as a homework desk, but would also be really handy as an office or crafting desk. I love this so much Sara…..can’t wait to try it out! Hi everybody! Its Sara from The Aqua House and I’m excited to show you my latest project. This desk was a team effort between my husband and I. I designed it, he helped me build it, and I did all the finish work. It’s the perfect mixture of Farmhouse Glam and Mid-Century Modern. The open face front allows for plenty of storage for school supplies, crafting tools, bills, etc. It’s the perfect size to fit your office computer and supplies — or your little scholar! The wider top gives them plenty of room to spread out to do their math homework (or pay bills, ha!). It would even be really handy to use in a craft/sewing room! And the stained top won’t chip or peel. In fact, a few scrapes across the top will only add to the rustic charm. 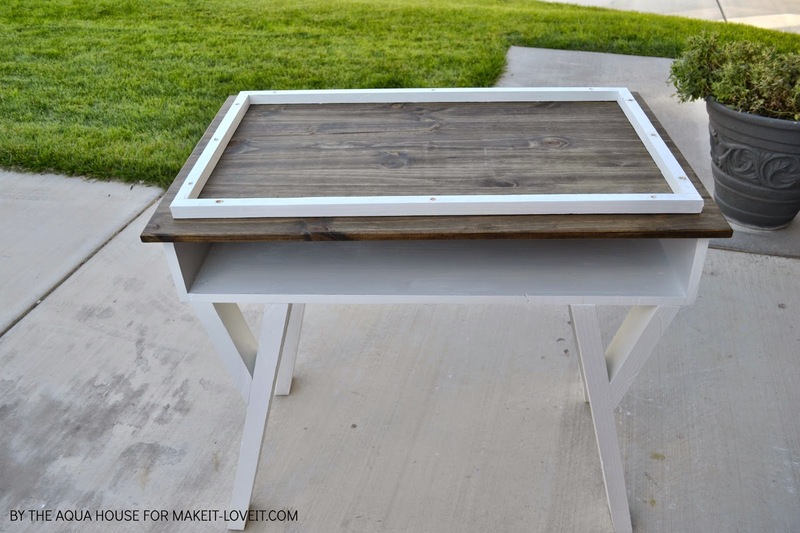 Are you ready to make your own Farmhouse Modern Desk? First off, we are going to cut out the legs. Set your saw to 15 degrees and cut the end of the 2×4 off. Measure your board from the SHORT point of the angle down 26 inches and make another 15 degree cut. You will repeat this step four times. These will be the long part of the desk legs. Next, we will be cutting the second, shorter part of the legs that are attached near the top of the desk. 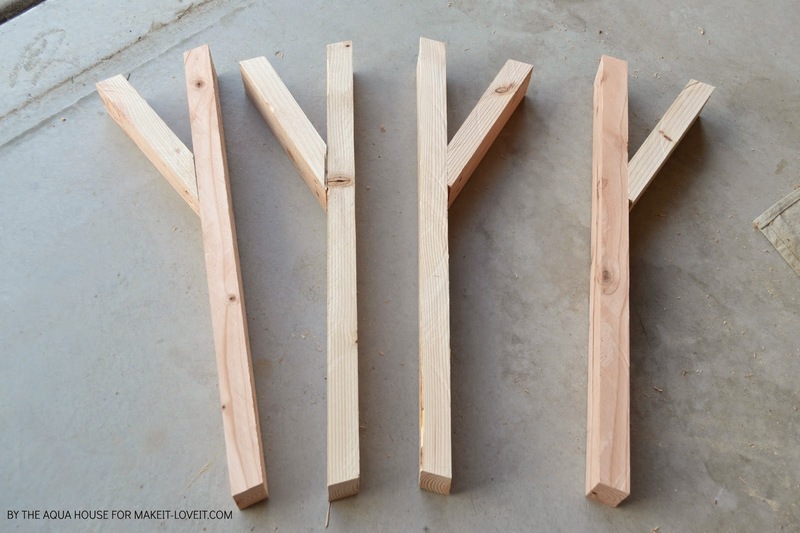 You will need 4 of these shorter pieces of wood, one for each leg. All 4 pieces will have 2 different angles at each end. 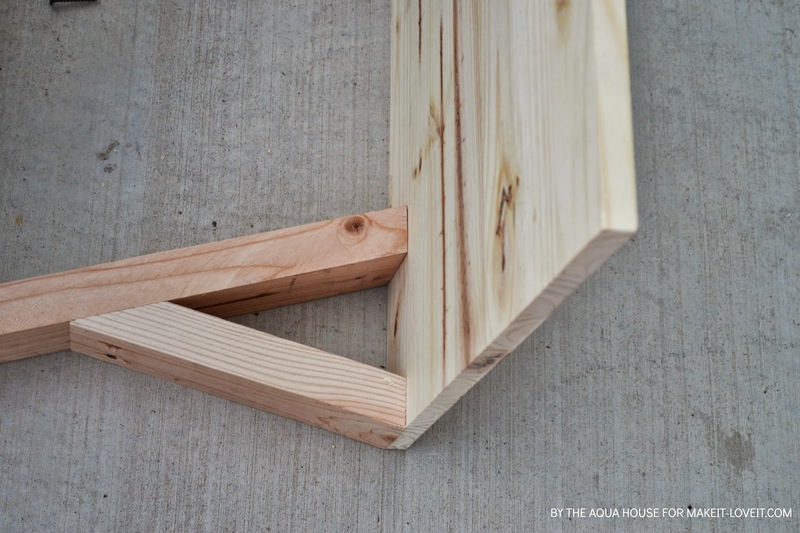 You will start with a 15 degree angle at one end of your board and will then measure down 10 1/4 inches. This time you will measure from the LONG point of the 15 degree angle. Right where you mark the board at 10 1/4 inches will be the long point of this second angle. 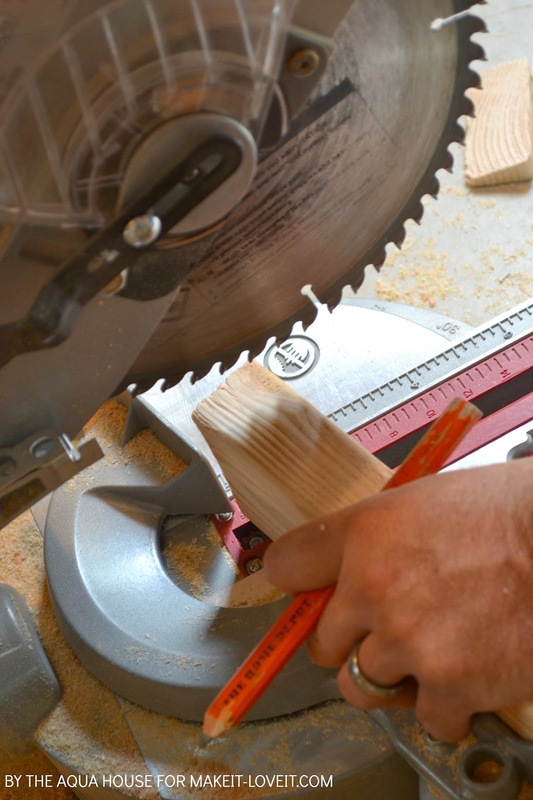 You will reset your saw to 30 degrees and cut the second angle. Now we are going to assemble the legs using the 1 5/8 inch grabber screws. 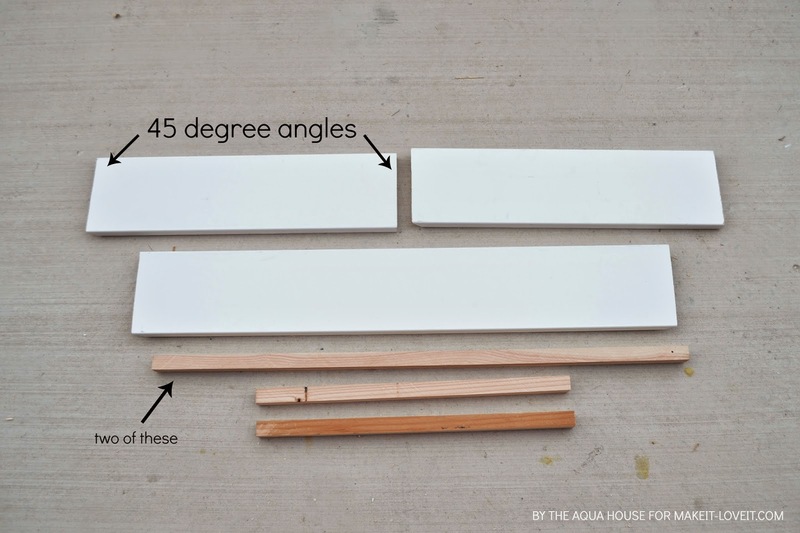 Lay your boards down on a flat surface and line up the 15 degree angles against another straight board. The leg will make a “Y” like the picture below. Screw the boards together (creating the “Y” shape) with two screws each. Repeat this step until you have four legs. Set the legs aside and grab the 6 x 2 foot piece of laminated pine. Measure three feet down on the board and make a straight cut. This will be your top. For the bottom, you will measure 32 1/2 inches and make another cut. 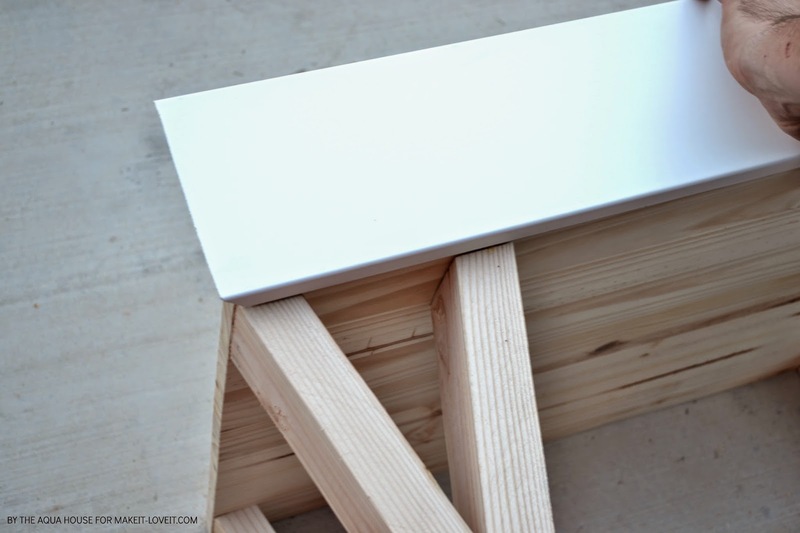 Since we want to top to overhang, you will need to cut your bottom board down from 24 inches wide to 20 1/4 inches wide. Next, use a router to bevel the edges as you’d like. I used a 45 degree bit. Now its time to apply the stain to both the top and underside of the desk top. Doing this step now will allow adequate time for your stain to dry and hopefully become less odorous (who wants their house smelling like stain?) before you finish the desk. This is also a great time to seal your stain. I chose to use a wax to seal mine. Since wax isn’t as tough of a finish as polyurethane, I made sure that I put three coats of wax on and I rubbed it in well. With your desk top drying, you are now ready to attach the legs to the desk bottom. 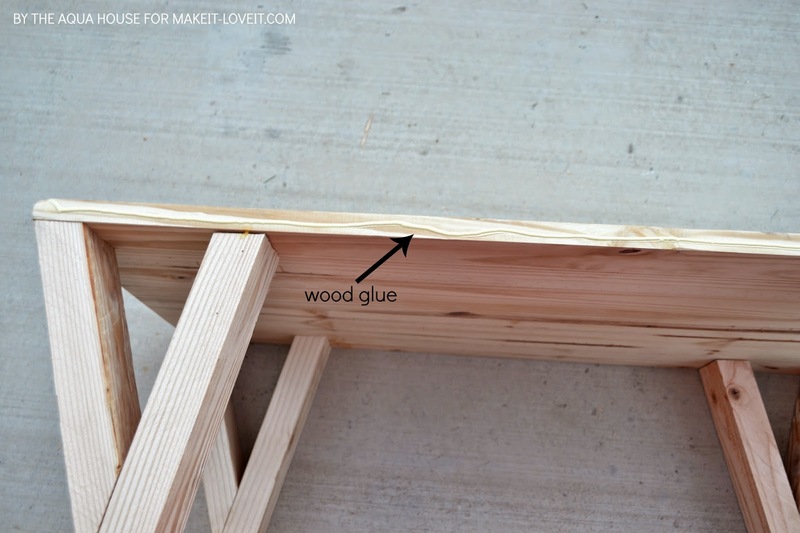 Apply a layer of wood glue to the tops of the legs and line them up at the corners of the desk bottom, with the smaller leg section towards the outside. 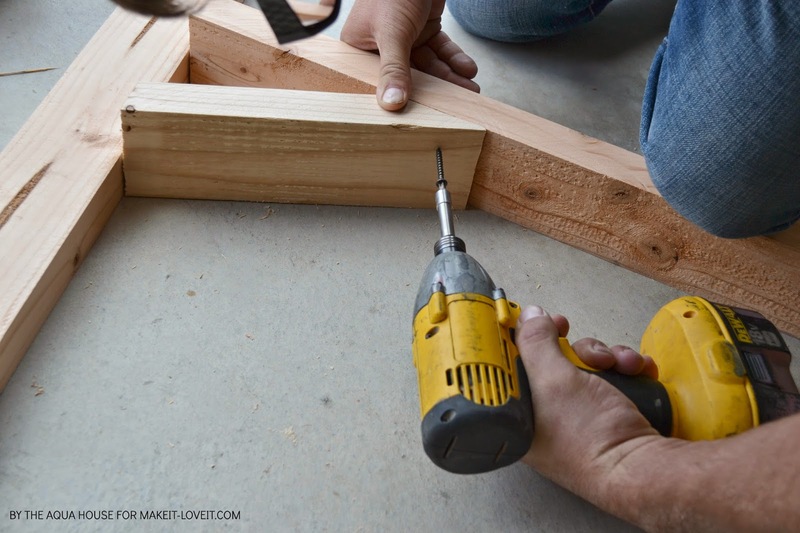 After temporarily attaching a leg with glue, use the 1 5/8 inch grabber screws to permanently attach the leg. Screw down from the top of the desk bottom board. Repeat until all four legs are attached. Next we will make the desk sides using the 8 foot by 6 inch piece of 3/4 inch pre-primed MDF. 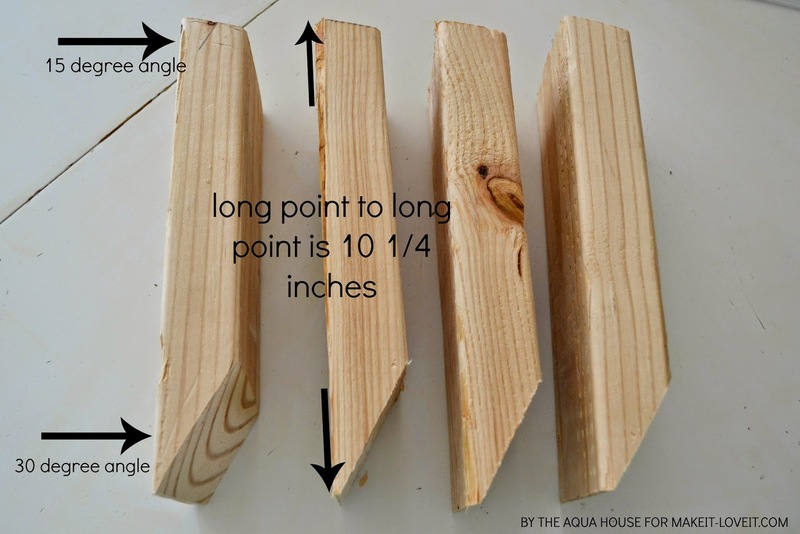 Set your saw to a 45 degree angle and cut the longer back piece at 34 inches (long point to long point). Then cut the two side pieces at 21 inches measuring from the flat, front side to the long part of the angle. At this point we will also cut the 7/8 inch square dowels to make the inside frame. 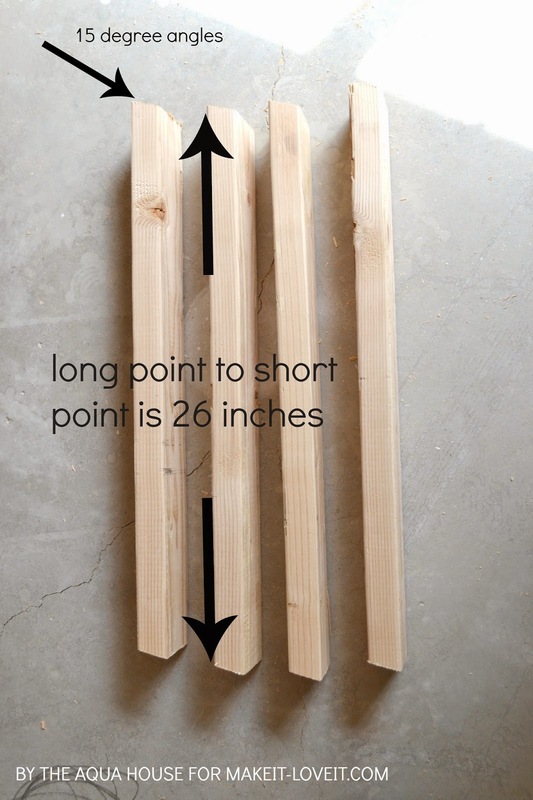 You will cut two longer pieces at 32 1/2 inches and two shorter pieces at 18 1/2 inches. 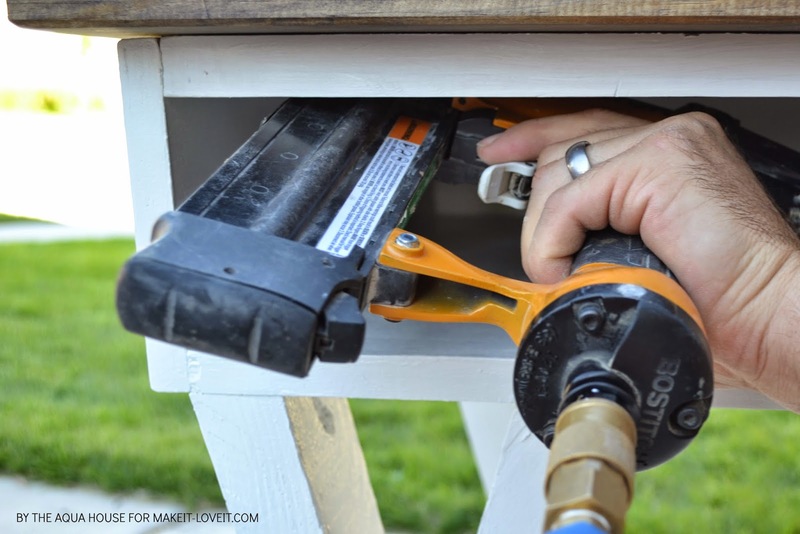 Attach all of the pieces together with a brad nailer, sandwiching the shorter pieces between the longer pieces, to make a large rectangle. Take your desk bottom and lay it on the ground. On the long side run a bead of wood glue. Then take your long (34 inch) piece of MDF and attach it with a brad nailer. Attach your two side pieces in the same manner, making sure to line up your angles. Then use your caulk and wood putty to fill any holes and gaps. 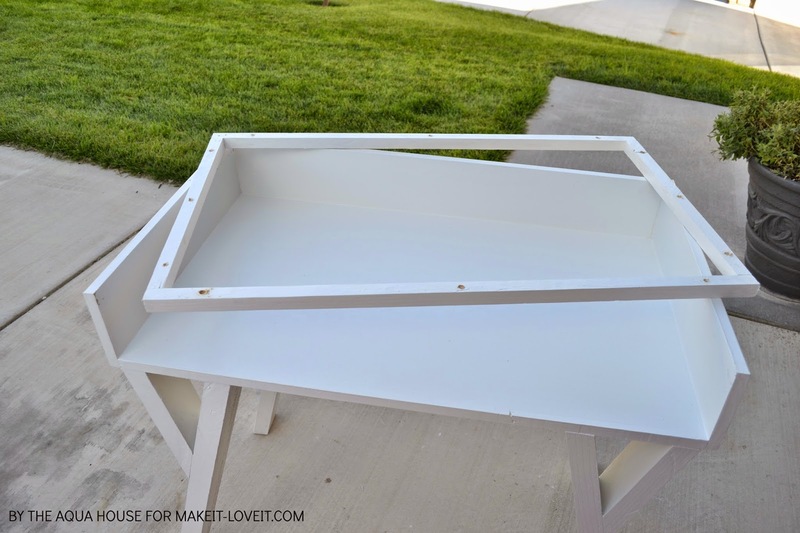 Your desk and inside frame are finally ready to paint! Allow at least one day for the desk bottom to dry. 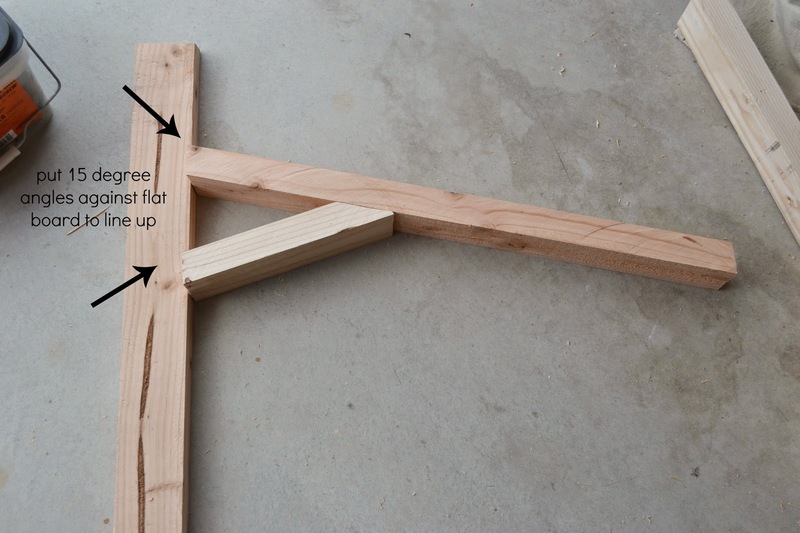 This will help you to avoid chipping your paint when you attach the top. 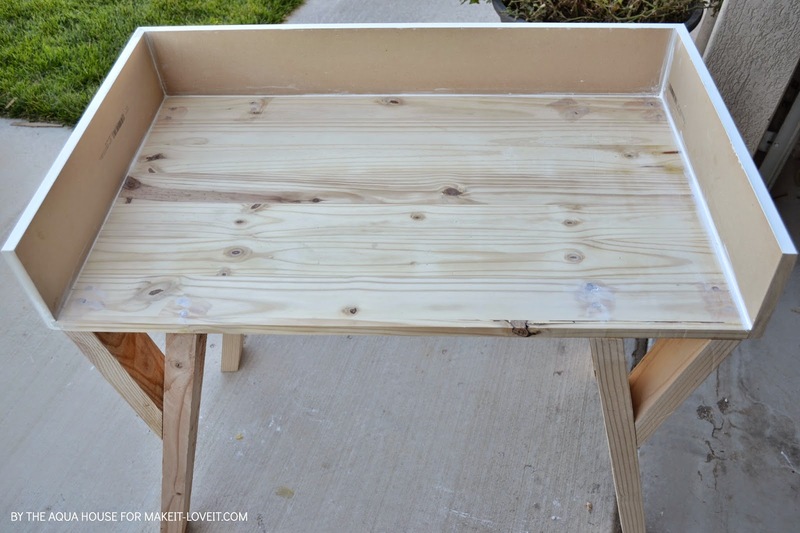 Take your painted inside frame and pre-drill holes in it where you would like to attach your desk top to it. 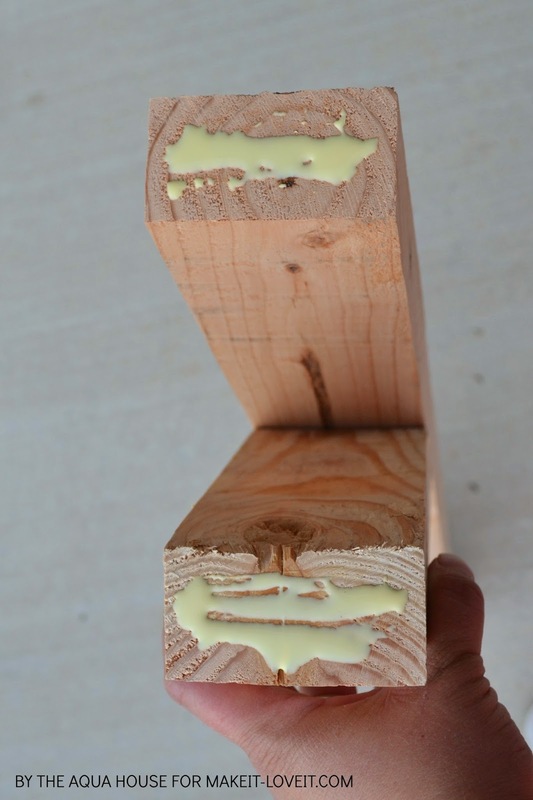 You will pre-drill holes in order to avoid cracking the dowel. Center the inside frame on the underside of the desk top. 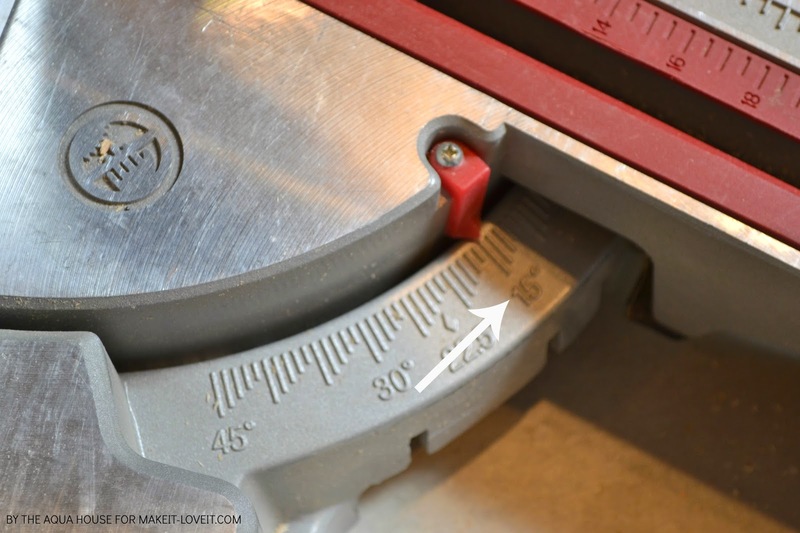 Take extra care to measure to make sure everything is centered how you’d like it. Then use the 1 1/4 inch grabber screws to attach the frame to the desk top. Flip the desk top over and slide it into the desk bottom. 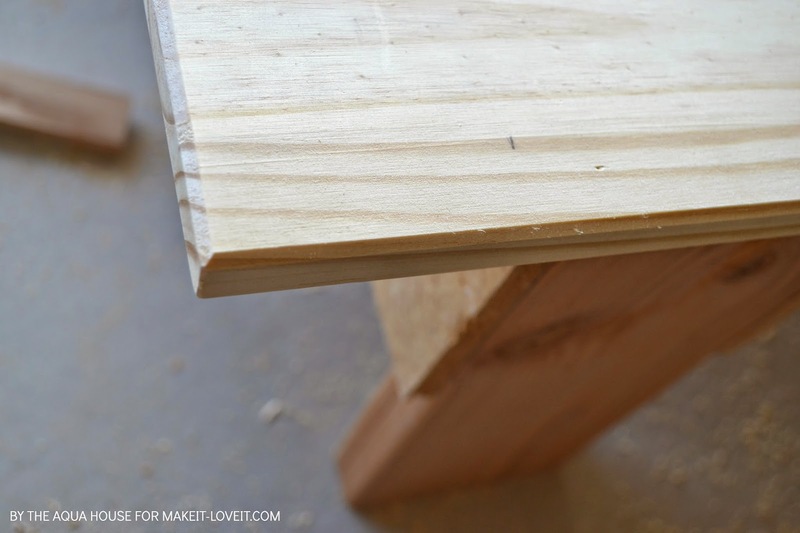 Along the inside of the frame, attach the desk top to the sides using a brad nailer. You are finished! 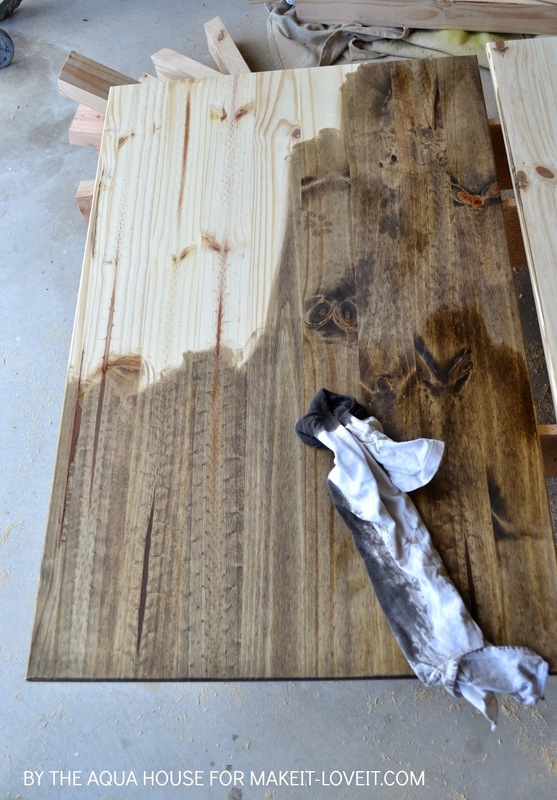 I suggest waiting a day or so to make sure your paint and stain are completely dry before using the desk. Then find that special place for your new desk. Whether its in your craft room, office, homework nook, or anywhere else! And hopefully you are as happy with your new desk as we are with ours! Chalkboard Lap Desk -- great for home AND the car! Love it! Looks great and can even see it as a slightly larger version with some divisions in the desk for organization. A larger version would be nice. I like the idea of dividers! Oh darn, I’m nowhere near there! I would definitely make you one if we were closer! You’re welcome! I’m so glad that you liked it! Simply awesome! thanks for sharing! Great project! However, as I did this, I noticed that both ends that make the top of the “y” cannot be 15 degrees with a 30 degree on the other end of the short piece. One end of the short piece must be a 45 while the other end can be a 30 degree cut. The pictures of the cuts even look like 45’s. Maybe I am misunderstanding the directions but through a bit of trial and error, I found one end of the short piece @ 45 degrees while the top part @ 30 degrees works best. I also noticed the problem with the measurements when I was calculating how to extend the legs of this desk (to make it into a standing desk). Thanks so much for posting the real measurements – I was a bit confused. The desk is awesome! the design is stunning! Great job! Thanks for sharing! I’ve been wanting to redo our classroom for a couple of years now, and this will make the perfect computer desk with the addition of a pull out keyboard tray!